Franklin Delano Roosevelt in 1933. 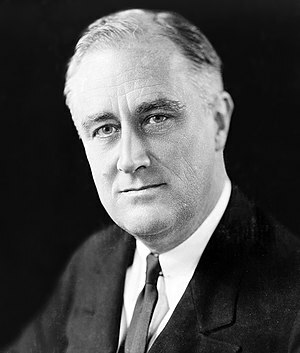 The New Deal was a series of programs launched by Franklin D. Roosevelt during his presidency. The New Deal was Roosevelt's way to solve the problems caused by the Great Depression, including unemployment and agricultural . The New Deal is often split into two smaller New Deals: the First New Deal and the Second New Deal. During the First Hundred Days of Roosevelt's presidency, Roosevelt and his administration proposed many plans to fix the economy. This page was last changed on 6 August 2013, at 23:45.